I have got a business requirement to only allow users in the same department to see the data that belong to their department. To do that in the SSAS tabular model 2016, you would need to create a table in SQL database then bring this table into the model. The table will contain the user’s first name, last name, login id, department name and/or employee id. The login id consists of the domain name and username. Once done, you would need to create a new role in the model. Go to the Model menu then select Roles to bring up the Role Manager. In the Members tab within the Role Manager, add users into the role. 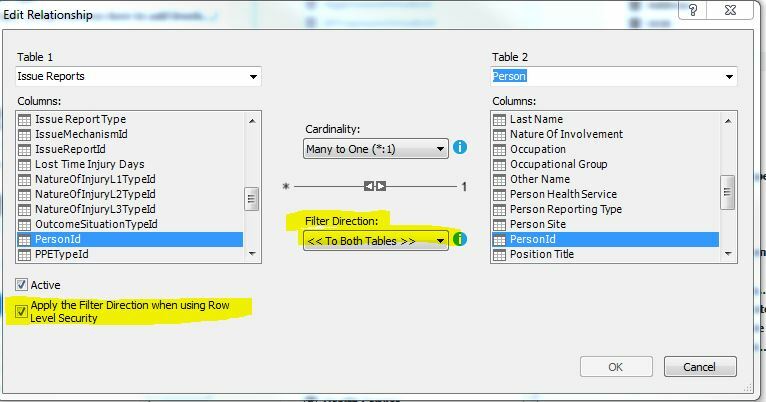 In the Row Filters tab, set the DAX filter for the fact table(s). 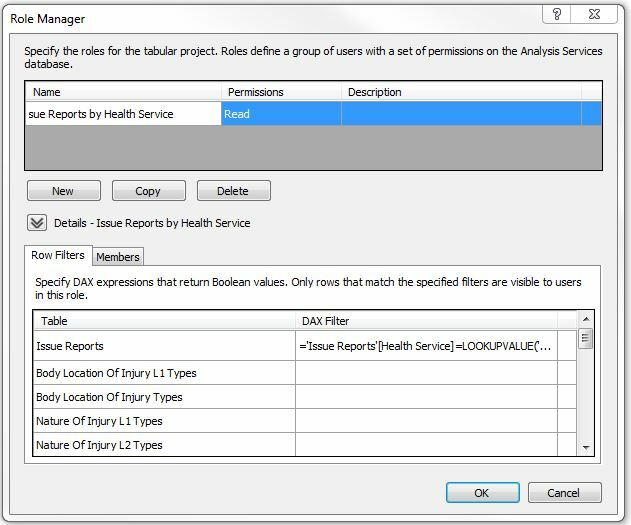 An example of the DAX filter is shown below that restricts users to see the data in the Issue Reports fact table based on which health service they belong to. The Users table contains a list of the users with their health service. 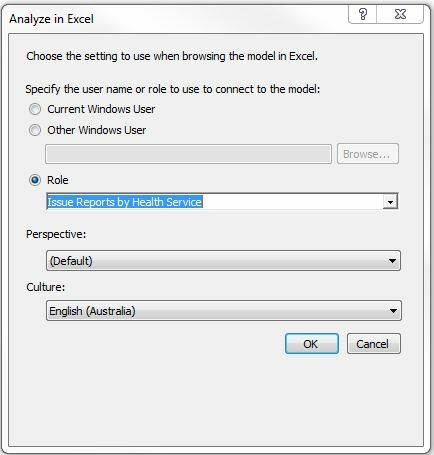 Click on the “Analyze in Excel” from the SSDT then choose the role you have just created or get the user to test it. To test on SSMS, browse the Cube and then click on the Change User icon. Is that possible to use the AD groups to perform the row level security in the tabular model? It does a lookup based on the LoginId in the Users table and the user’s username returned from the USERNAME(). If it matches, then returns with the health service the user belongs to and then returns with the issue reports for that health service. I googled if there is a IS_MEMBER function in DAX or something similar and I haven’t found any solutions. The workaround is to create two roles and then do a dax filter on the objects. We created two roles in the model i.e. one for East Metro and another for South Metro and then do the dax filter on the facts and/or dimensions. We only have 2 dimensions that have health service so we will use bi-directional row level security on one of the dimensions and use dax filter on the other dimension. The solution is to set the ConsumeContainerWhitespace property of the report to true. When the subreport is run on its own, it does not generate any blank page, however, when it is placed on another report, it generates a blank page. To solve this, make sure the subreport has the same size as the original report (page size) for the subreport. In SQL, this can be done using the following query where you get the max duration for each IssueReportId first and then add them together. To do the above SQL in DAX, use the SUMMARIZE function and then use the SUMX function to sum them up in the tabular model. I noticed that whenever I changed the user permission on the derived hierarchy or model, the change did not happen immediately. I have 3 entities that have been set up in a way that when an attribute of a member has changed value in one entity, it will be copied or moved to another entity. I am doing this in a stored procedure under the usr schema and then setting up a business rule for it. While testing it, the member didn’t get moved or copied across. So the business rule didn’t work. The record has a member error code of 4 in the staging table. Run the following query to view the errors that occur during the staging process. Replace name with the staging table name in the query. This error means that the attribute value references a member that does not exist or is inactive. Check the attribute list and the attribute type in each entity and make sure that they have the same configuration. Also, when you stage domain-based attributes, you must use the code, rather than the name. Applies to ImportType0, 1, and 2 (reference: https://docs.microsoft.com/en-us/sql/master-data-services/staging-process-errors-master-data-services?view=sql-server-2017). So in your stored procedure, ensure that you only use the code to insert and not the name or both. The reason why it’s not updating is because the schema has not been included in the update. So if your objects are created under a certain schema, the schema needs to be included. Also, the schema needs to be at the top of the list otherwise the rest of the objects will be not added into the project in TFS. To get it to the top of the list, you can group it by schema as shown below.